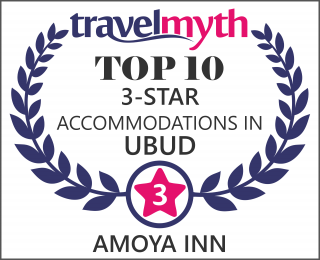 Amoya inn is small family run boutique hotel which are located in center of ubud as well-known the island culture centre and nearby villages brimming with artists workshops and galleries. set in Balinese family compound with in 6 units room accommodation and surrounding by the natural environment of beautiful rice paddies and relaxing atmosphere. This site are suitable for the traveler who are seeking the best of both worlds in terms of experiencing Balinese culture on a family compound but with the privacy of their own space. Stay in true Balinese compound in your own privacy. With in 60 minute drive from Ngurah Rai International Airport and the house of Balinese Indonesia art and culture. Relax and Spoil yourself by sunbathing in our swimming pool or take a morning walk around country side to explore the Balinese life and culture.